Which software do you use for your numerical experiments? I am used to use GNU Octave for pure numerics, even if I play sometimes with Scilab, Python, GNU R, and Maxima for algebraics. Many people do not like Octave because it is command line oriented. Regarding these aspects, I was delighted to discover the quite exciting message below when updating my Debian distribution today. 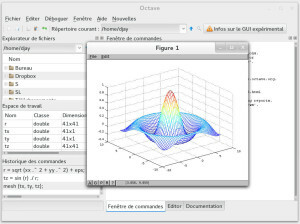 At long last, GNU Octave 3.8 comes with native QT GUI and JIT compiler. Give it a try! experimental graphical user interface (GUI) based on the Qt toolkit. giving the `–force-gui’ option to the octave binary. compiler, which can offer performance improvements in some situations. you can activate it with the `jit_enable’ command. Maybe Julia (http://julialang.org) sounds promising ? Thanks, Adrien. Well, who knows! Julia is powered by Lapack, like most of its competitors. Debian contains a package for Julia, but not yet for the GUI Julia studio, which seems to be a fork of QTcreator. Julia does not seem to have a native GUI for now. Wikipedia page on Julia.